This photo was taken in 1928 when Falleni was about 53 years old. From NRS 2496, 3-6007, photo 741, State Reformatory for Women, Long Bay, Photo decription books. 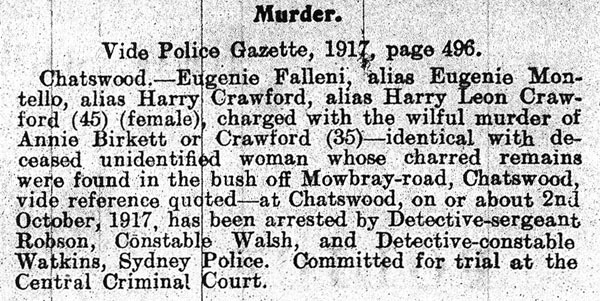 Eugenia Falleni's arrest for murder and the subsequent trial a few months later caused a sensation in Sydney in 1920. Falleni, also know as Harry Crawford, dressed as a man and had married two women. The first of his wives, Annie Birkett, may have been killed after she discovered the fraud. Not much is known about Falleni's early life. She came to Australia from Italy, via New Zealand by 1898. She soon had a daughter Josephine, who may have been the girl born to an unmarried Lena Falleni in Woollahra in 1898. Falleni does not appear to have looked after the child. Instead she became Harry Leo Crawford (sometimes known as Jack Crawford) and worked in a series of low skilled jobs, such as a hotel useful, around Sydney. In February 1913 Harry married the widow Annie Birkett and they opened a confectionery shop in Balmain. Annie disappeared after going on a picnic with Harry on 28 September 1917. Below is a selection of records that follow Falleni from 1917 to her death in 1938. 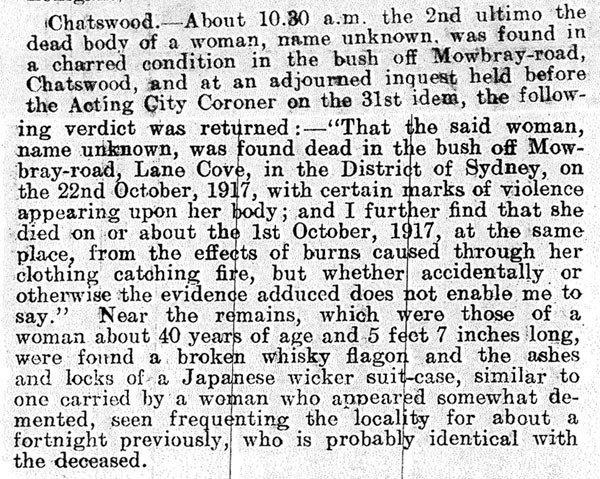 The first autopsy on the unknown woman was undertaken on 3 October 1917 (see top half of page). There were many fissures or fractures in the skull, mainly due to the heat of the fire, but the coroner could not tell whether she was dead before the fire started. The initial inquest returned an open verdict on 31 October 1917. Annie's body was exhumed and re-examined on 22 July 1920, maybe in an attempt to positively identify the remains (see bottom half of page). A large linear crack to the back of the skull was discovered under xray. From NRS 1789 [3/2209] Post Mortem registers, 1916-18. Close up of left hand side of page in the post mortem register. 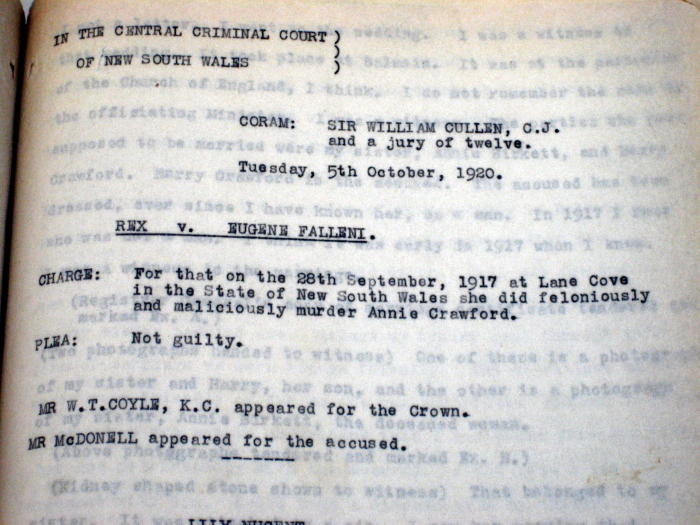 This photo displays the two main records of the Falleni trial held in the State archives. On the left hand side is the typed record from the Court Reporting Office of the trial. 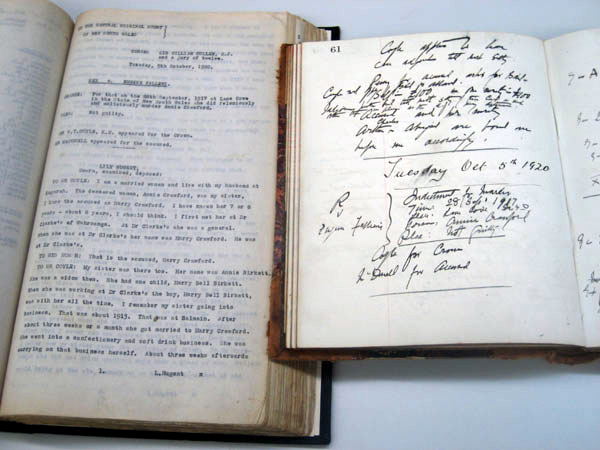 The other volume is the handwritten notebook of Chief Justice Cullen, the trial judge. Both volumes are open to the first day of the trial. Falleni pleaded Not Guilty to the charge of 'feloniously and maliciously' murdering Annie Birkett. 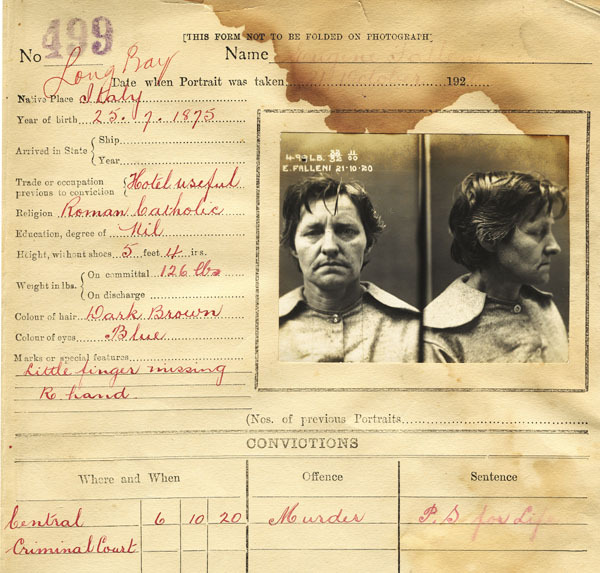 Eugenia claimed to have been 'unnerved by three months detention in Long Bay gaol and could not speak as she wished in declaring her innocence'. The 'Man-Woman' trial caused a media sensation not just in Sydney but Australia wide. No real explanantion was offered though, as to why Falleni acted as she did. 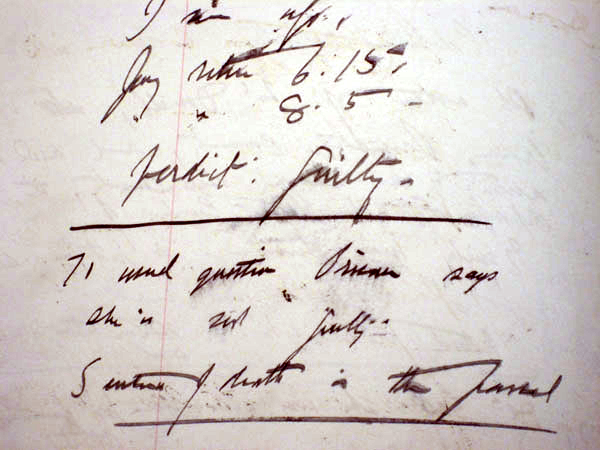 This handwritten record of Falleni's trial was kept by the presiding judge, Chief Justice Cullen. The trial started on 20 October 1920 and lasted for two days. Falleni's defence started after lunch on the second day and was concluded by 3.10pm. The prosecution case was centred on proving that the body was that of Annie Birkett and that Falleni was the last person to see her alive. There were numerous witnesses testifying to the rocky relationship and the distraught behaviour of Falleni in the weeks after the murder. Much of the evidence focused on the timeline in the week surrounding Annie's disappearance when Falleni was distraught and frequently found drinking alone. 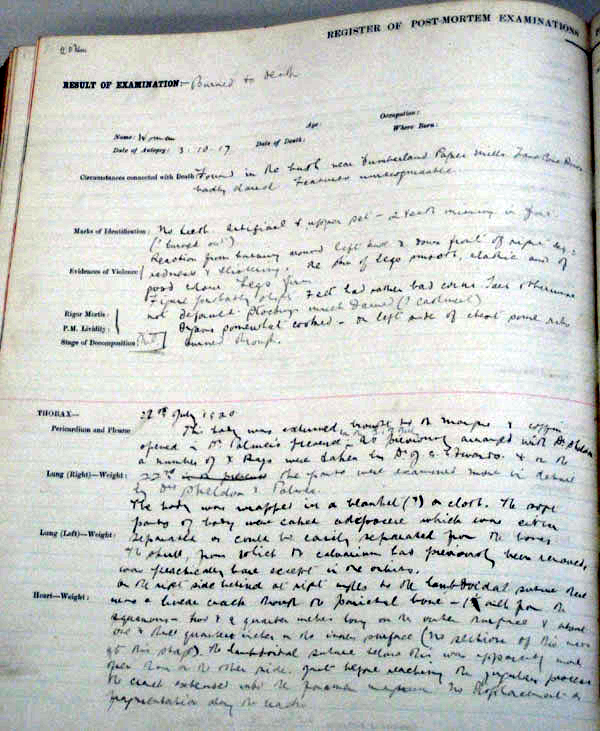 The evidence of Annie Crawford's son, Harry Bell Birkett, starts on the right hand page. Eugenia's daughter Josephine, hiding behind a black veil, also gave evidence at the trial. 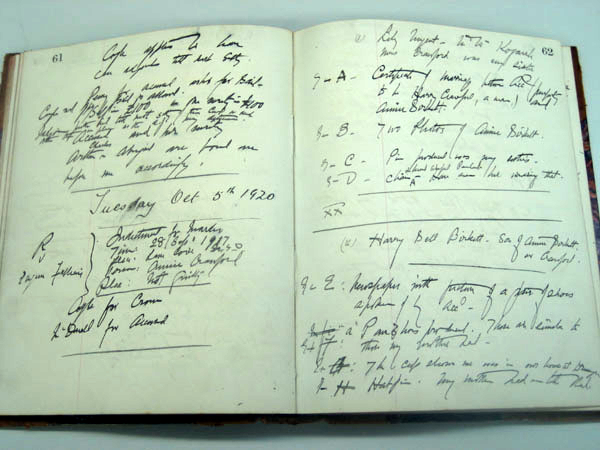 NRS 5808 [7/9318], handwritten notebook of the presiding judge, Chief Justice Cullen, at the Falleni trial. The transcript is open to the first day of trial. Falleni continued to deny the charges and made a statement in her defence from the dock: 'I do not know anything at all about this charge. I am perfectly innocent. I do not know what made the woman leave her home'. Falleni continued with this line of defence even though the body of Annie Birkett was identified by dental records, clothing and jewellery. The evidence of Henrietta Schielblich was perhaps the most damning though. Henrietta spoke of a conversation with Falleni in the weeks following Annie's death when a distraught Falleni claimed to have had an argument with Annie: 'I had a jolly good row with her and gave her a crack on the head and cleared [off]'. NRS 2713 [6/1077 p.68], Court Reporting Office. This is the last entry in the Justice Cullen's notebook with the guilty verdict and death sentence. The jury deliberated for about two hours before returning the guilty verdict. Falleni continued to claim that she had never been to the area in Lane Cove where the body was found and said she was found guilty 'on false evidence'. NRS 5808, [7/9318], p.99. 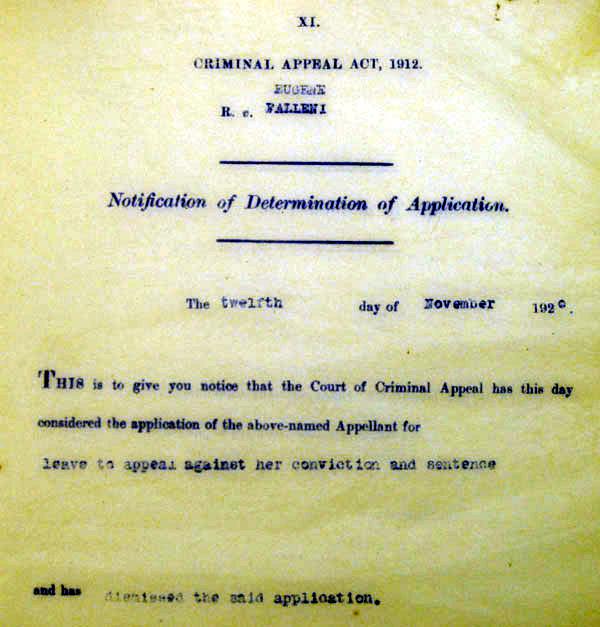 Image 1 of 2: Falleni requested leave to appeal her conviction on 13 October 1920. This request was refused on 13 November 1920 but a State Cabinet meeting on 30 November 1920 agreed to commute her death sentence to a life sentence. She was eventually released from gaol early due to continued ill health in 1931. Image 2 of 2: One of many letters that relate to Falleni's attempts at appeal. This one notifies her of the dismissal of her application to appeal her sentence. There are a number of letters relating to Falleni in this volume but many are hard to read as the volume contains carbon copies of letters only. NRS 2698 [3/4819], Court of Criminal Appeal letter book. This photo was taken in 1920 soon after the end of Falleni's trial. She was 45 years old and at the begining of her life sentence. A short haired Falleni could easily pass for a man by the looks of this image. There are references in her trial to the accident that lead to Falleni losing her little finger (the accident occured between 1917 and 1920). Another gaol photo was taken eight years later. From NRS 2496 [3/6006 p.499, 1920], State Reformatory for Women, Photo description books. This is a later gaol photo of Falleni, taken in 1928. This image shows an older Falleni in three different poses. The clothes Falleni is wearing in the photo were often provided by the gaol or the photographer and were not necessarily her own. In comparison to the previous goal photo taken in 1920, this photo shows a softened and more feminine Falleni. She is about 53 years old in this photo and she was released from gaol in 1931, three years after this photo was taken. Her early release was on compassionate grounds due to continued ill health. From NRS 2496 [3/6007 photo 741, 1928], State Reformatory for Women, Long Bay, Photo description book. The reverse side of the description card contains the gaol history of Falleni, including time spent in the Coast Hospital. There are several references to Falleni in NRS 2502, Record of cases treated in Gaol hospital. Falleni was released in 1931 under the assumed name of Jean Ford. The other side of the description card contains similiar details as to what is on the photo description records. 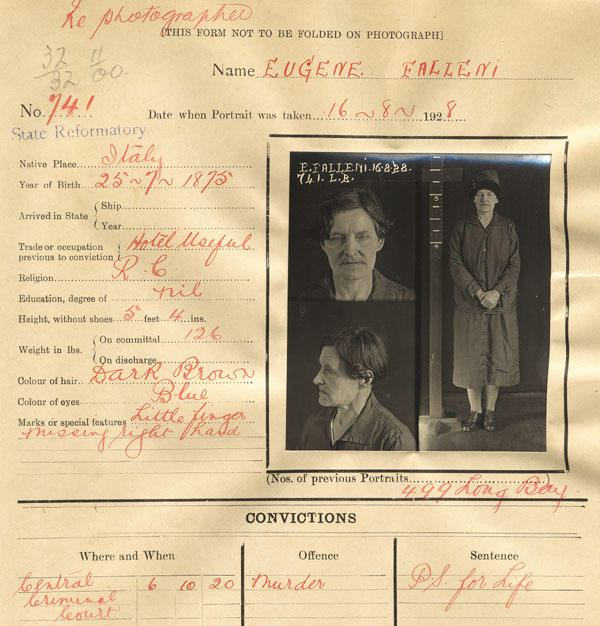 NRS 2493 [11/3128], State Reformatory for Women, Long Bay, description card, Side B.
Falleni died in Sydney Hospital on 9 June 1938 after being struck by a motorcar on Oxford Street, Sydney. 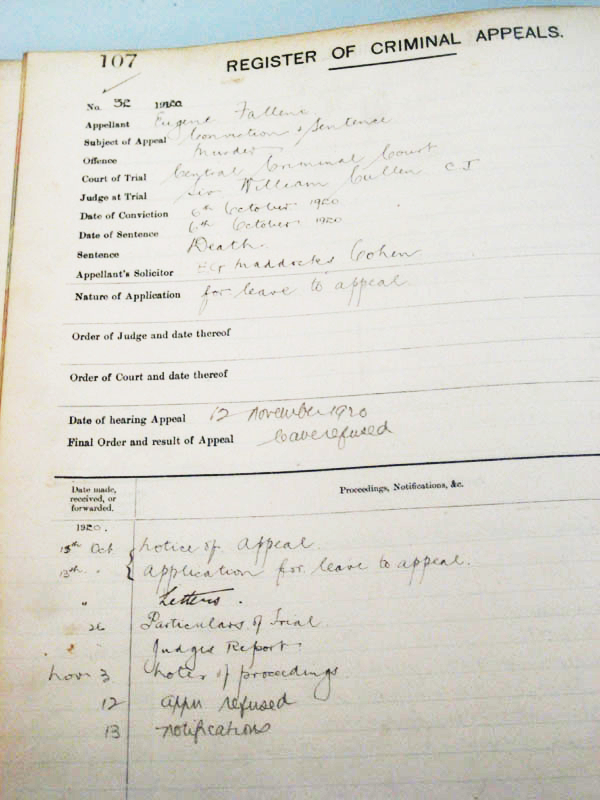 This entry from the Coroner's inquests register shows: inquest number (1122); date proceedings received at Dept (30 June 1938); name of deceased (Eugene Falleni also known as Jean Ford); date inquest held (29 June 1938); where held (Sydney); Verdict (accident); Coroner (illegible). No other inquest papers have survived. Falleni was buried in Rookwood Cemetery. 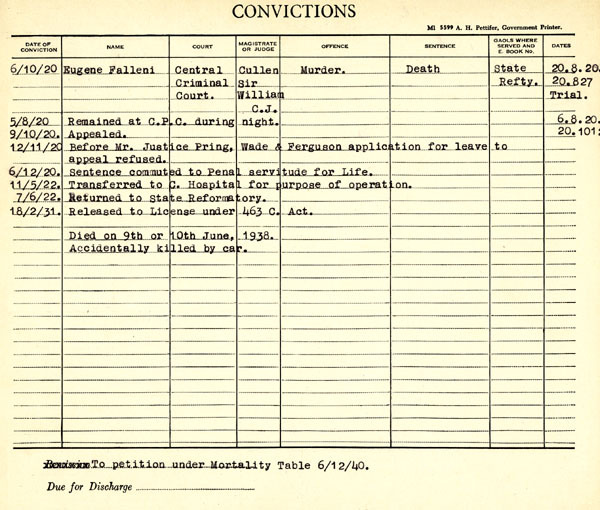 NRS 343 [3/960, #1122 in 1938], Registers of Coroners' inquests. The table below is a list of records that have been consulted in the creation of this webpage. Copies of some of the records can be found in the images above but many of the references can be used for future research.